Today I am really excited about these new pieces i'm wearing! I have not purchased a lot of actual maternity clothing, because a lot of the items I have or buy can fit me with this belly of mine. This skirt is one maternity piece I invested in. I couldn't help it. It is so unique and different (and it's on sale right now). 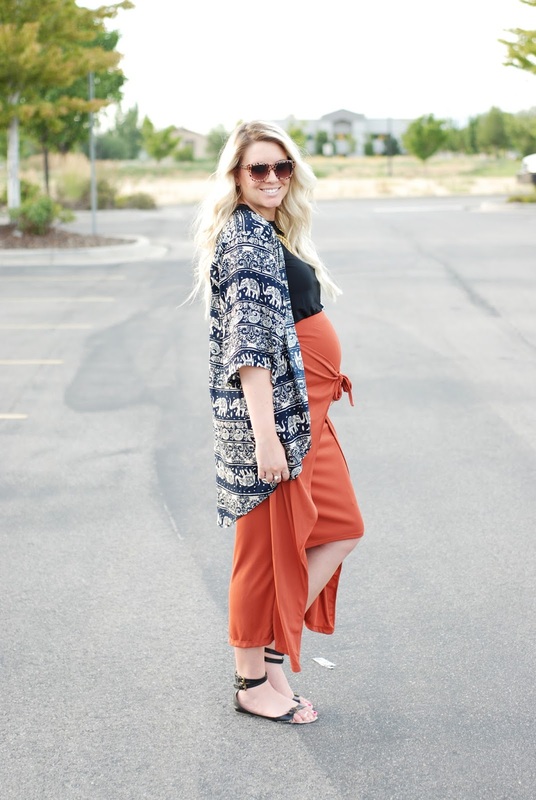 I paired this skirt with a super cute high low top that is hidden by my skirt, and a cute kimono. I love these colors together, it reminds me a little of fall (which I am so beyond excited for). Both this top and kimono are under $14 right now at Choies (see links above or pictures below). I am all about the bargains especially on pieces I know I can wear several different ways! Check back tomorrow for another post and thanks for stopping by today! !